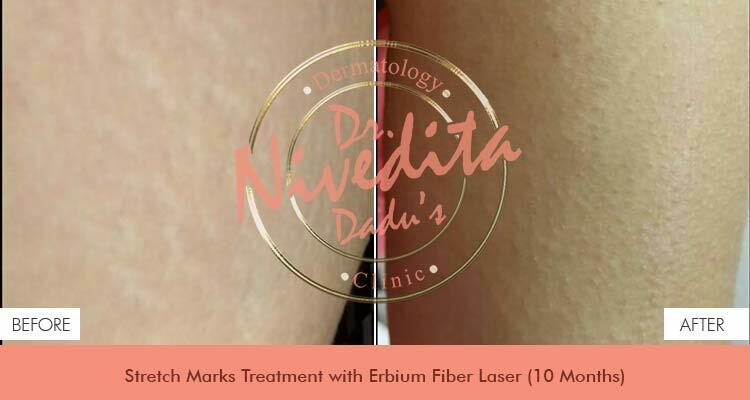 For treating stretch marks, we at Dr. Nivedita Dadu Dermatology Clinic, Rajouri Garden, utilize Fractional erbium fiber (ResurFX, Lumenis) laser. ResurFX laser uses the “only one pass” formula. ResurFX is effective and minimal time consuming. ResurFXutilizes an advanced scanner and a fiber laser of 1565 nm. This is a non intrusive process carried out with the help of fractional laser technology. It is highly precribed as a reliable treatment for stretch marks because of less hazard involved and no downtime. The microbeams penetrate deep causing regrowth of cells and collagen remodeling. can improve the unsightly color and skin texture related with stretch marks, leaving clients with smoother, better-looking skin.